So who are GoCoins’s customers? GoCoin has a B2B2C business model. It combines B2B and B2C models to deliver a complete service transaction – in this case easy payment with bitcoins. On the B2B side customers are e-commerce platforms. On the B2C side their customers are the consumers at the e-commerce platforms. So like PayPal GoCoin is a payment processing ‘plugin’ that allow consumers to quickly and easily purchase online. This is a pretty huge target market. For GoCoin the key is in working out who the early crypto-coin adopters are and where they buy and then selling the plugin integration to the e-commerce store. However we do have the normal chasm problem. Both Bitcoin users and E-commerce stores accepting BitCoins are early adopters and haven’t really crossed the chasm yet. I think they are both at slightly different stages with the e-commerce stores being closer towards the Innovator end. We make accepting Bitcoin safe and easy. Private billing, secure payments, no sign up costs and low fees. The problems being solved are two fold. First the perception for many people (potential Early Majority) is that it is difficult and time consuming to pay using BitCoin. As a consequence the risk in buying them is too high and this puts a dampener on the whole market. If it is as easy to use BitCoin (or any of the other crypto-currencies that GoCoin supports including Litecoin and Dogecoin) then the transaction cost is significantly reduced and then BitCoin becomes normalised as another payment mechanism – just the same as cash, cheque, Amex or Visa. For the merchant in almost all cases the revenue from crypto-currencies is always likely to be a portion of total revenue, probably a small portion. Accepting additional currencies is a balance between the incremental sales that can be achieved and the margin impact of the payment processor charges. There is also the development cost in implementing and maintaining it. With low demand for BitCoin there is little incentive to put scarce resources into the problem. So GoCoin takes that pain away and makes it a no-lose decision. The cost and security are similar to other payment systems. The incremental sales gained as a result are more than likely (the promise) to cover the small setup cost. The most powerful channel in the GoCoin business model is engineering as marketing where the payment process has a ‘Powered by GoCoin’. Everyone who uses the system knows that GoCoin is the payment processor. A certain percentage will then click through to the GoCoin site and sign up. This is exactly the same as PayPal, Intercom and others. As their customer’s grow the effect becomes more powerful and with more customers there will be a significant scale effect. it’s unclear what the minimum efficient scale is likely to be – 5-10% of websites (by number) would be powerful but that would leave 80% by value in the hands Amazon et al. They will only signup if there is a compelling reason to use GoCoin – which is massive user adoption – and even then if it is easier and cheaper than using their own engineering resources. There is also the use of existing platforms using the major ecommerce platforms such as Woocommerce and Shopify to offer the pugin through their stores. This will also involve a fair amount of store SEO and CRO to maximise downloads, installation and activation. Finally there’s a strong PR push both in the BlockChain world and into the wider tech arena. The key activities are running the payment processes, fraud prevention and detection and product development. Starting with the fraud – GoCoin is like a bank and it needs to have the trust of its partners that contracts will be completed. It does this with a strong emphasis on security in its offering and apparently in the underlying coding. This is likley to be continuing and everlasting project to keep the cash safe for customers, consumers and itself. Usefully GoCoin appears to take on all liability risk for transactions providing partners with the additional reassurance that they require. Managing and optimising the payment processing is the key task. If payments can’t be accepted or made then there is a big ***** problem. To a large extent this should be automatic but with a new and growing product there are always likley to be manual interventions – for example at East 2017 payments were delayed because of bank closures. The product development will focus both on increasing the UI/UX in the payment process and reducing cart abandonment – and thus increasing the payoff for the merchants and GoCoin’s own revenue. This will also include improving the apis and bringing new currencies onto the platform. The key resources for the GoCoin Business Model are the deep knowledge of the bitcoin industry and payment processing that the team has. The software team is undoubtedly strong but is essentially fungible. What’s more important is GoCoin’s ability to sit at the nexus of alternative currencies and mainstream e-commerce and offer a solution that meets the needs of both parties. It’s also powerful that GoCoin has a lot of industry expertise on board but this isn’t a strong moat as many other competitors will have this as well. Long term the moat is really going to be adoption by a significant proportion of second tier e-commerce sites or a very large number of small sites. This traction will be very strong but until then GoCoin is vulnerable as there are multiple ays of delivering the same VP. Partnerships are important to the GoCoin model and broadly are divided into partnerships with crypto currency providers – BitCoin, DogeCoin etc. The other critical partners are the e-commerce platforms which make GoCoin available in their market places. The costs are pretty much a pure software engineering play with the salaries and software that go to support that. Marketing is lite because of the use of engineering as marketing and existing platforms. Revenue is straightforward and is 1% of sales made using the platform with no charge back. The revenue model can be kept simple because integration is easy and automatic and this means that costs are much lower than say PayPal’s 2.9% – in part because there are no refunds or repayments which reduces much of the fraud issue. And there you have it our review of the GoCoin Business Model. Please feel free to comment, criticise and suggest improvements in the comments section below. 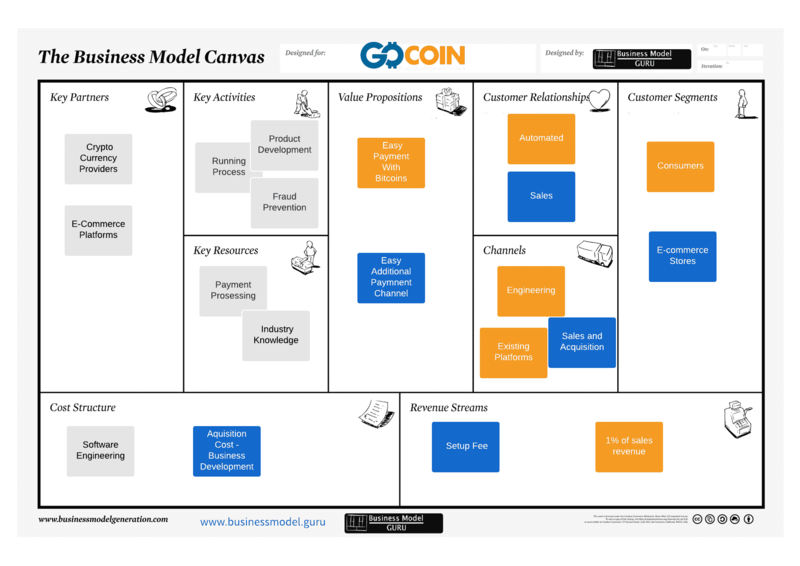 This blogpost is part of a series where we highlight a successful business and explain the Business Model Canvas.